I must own this game! 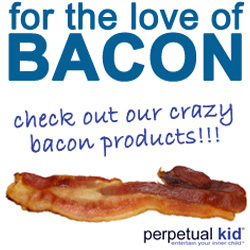 I love these bacon novelties ! I remember seeing an ad on an infomercial that advertised an alarm clock that cooked bacon. When your alarm was set to go off, the clock would gently fan the smell of the bacon out to wake you up. Who wouldn't like to wake up the smell of bacon every morning. Plus, you could eat the bacon after you woke up.